Basketball, unlike football with its prescribed routes, is an improvisational game, similar to jazz. If someone drops a note, someone else must step into the vacuum and drive the beat that sustains the team. People think I would never take on a team that has no legitimate chance to win a championship...This is one of the major misconceptions about me. Success can be measured in many different ways...Either way, I would find the challenge invigorating. I think the most important thing about coaching is that you have to have a sense of confidence about what you're doing. You have to be a salesman and you have to get your players, particularly your leaders, to believe in what you're trying to accomplish on the basketball floor. In basketball, as in life true joy comes from being fully present in each and every moment, not just when things are going your way. Of course, it's no accident that things are more likely to go your way when you stop worrying about whether you're going to win or lose and focus your full attention on what's happening right this moment. Yes, victory is sweet, but it doesn't necessarily make life any easier the next season or even the next day. Like life, basketball is messy and unpredictable. It has its way with you, no matter how hard you try to control it. The trick is to experience each moment with a clear mind and open heart. When you do that, the game and life will take care of itself. New Updates! (4/24/2019) We've been working really hard on completing our membership system so you can submit quotes and keep track of them. Once this is complete in the coming weeks there will be a lot more quotes by Phil Jackson and other authors. We've also changed the sorting on the site so you now see the latest Phil Jackson quotes first. 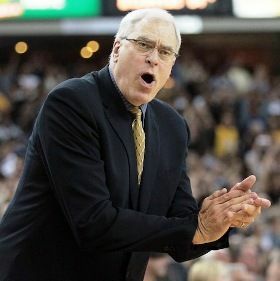 Our goal is to have the best Phil Jackson quotes on the web!